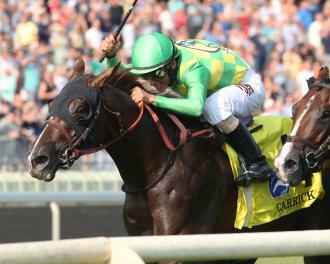 Carrick, a son of the recently deceased Giant's Causeway, wins the Grade 1 Secretariat Stakes at Arlington on Saturday. Operation purchased three fillies during the Aug. 7-8 Fasig-Tipton Saratoga sale. Donegal Racing, best known for campaigning the likes of grade 1-winning males such as Dullahan, Keen Ice, and Paddy O'Prado , branched out this summer by adding fillies to the roster. The only time he ever ran at Saratoga Race Course, Keen Ice made people cry. And that's because he won. Donegal Racing and Calumet Farm's grade 1 winner Keen Ice completed his major preparations for the Aug. 5 $1.2 million Whitney Stakes (G1) at Saratoga Race Course with a half-mile work July 29. The recent three-length winner of the Suburban Stakes (G2) July 8 at Belmont Park, Keen Ice took to the main track early Saturday in company with graded-stakes placed stablemate Patch, finishing just ahead of his workmate to cover the distance in :49.09 and galloped out strongly past the wire. Donegal Racing's Arklow was originally slated to aim at the Kentucky Derby on the dirt, but after he was unsuccessful there, trainer Brad Cox switched him over to the turf. The 3-year-old son of Arch scored a 3 1/2-length maiden victory on the lawn at Keeneland, and confirmed that grass presence with a win on the Kentucky Derby undercard in the G2 American Turf Stakes. Coming into this year’s compelling renewal of the $10-million G1 Dubai World Cup, it is difficult to look past the overpowering presence of heavy favorite Arrogate (Unbridled’s Song). Can Keen Ice Pull Off the Impossible - Again? Going into the 2015 Travers Stakes, all the talk was on Triple Crown winner American Pharoah. Shipping in from the West Coast, it looked like the Travers was going to be a walk in the park for him. Aided by a speed duel between American Pharoah and Frosted, Keen Ice come from far back to pull off one of the biggest upsets in racing history. The Pegasus Cup is coming and everyone is focused on a 2 horse race, Arrogate Vs California Chrome, but I will be having an bet Each Way (Win Place Show for the Americans) the two Todd Pletcher starters Neolithic and Keen Ice.